You are better off baking, roasting, grilling or steaming your food instead of frying it. Frying food increases your fat and calorie intake, especially if you bread foods before you fry them, fry at too low of a temperature or put too much food in the pan at once. 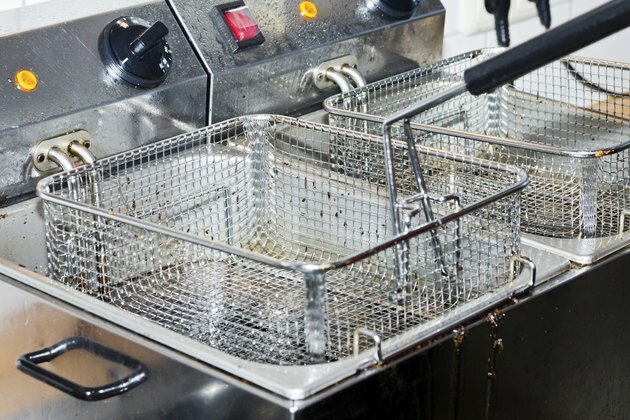 Putting too much food in the pan at one time lowers the temperature of the oil, and lower oil temperatures increase the amount of time it takes to fry the food, thus increasing the amount of fat absorbed during cooking. The high fat and calorie content in fried food increases your risk for numerous health problems. Foods high in fat, such as fried foods, are also higher in calories, since a gram of fat provides 9 calories compared to the 4 calories found in each gram of protein or carbohydrates. If you eat fried foods regularly, you are more likely to become overweight or obese. A study published in the February 2013 issue of "Nutrition, Metabolism and Cardiovascular Diseases" found that consuming fried foods more than four times per week increased the risk for obesity compared to consuming these foods less than two times per week. Southern cuisine, which typically includes a lot of fried foods, may increase your stroke risk, according to a February 2013 CBS News report. You'll increase your risk of a stroke by 41 percent if you eat fried Southern dishes at least six times per week compared to eating this type of food less than once a month, according to a study led by University of Alabama, Birmingham, nutritional epidemiologist Dr. Suzanne Judd. If you fry your foods in a type of fat that provides a lot of saturated fat, such as butter, lard or coconut oil, it may also increase your cholesterol and your risk for heart disease. Consuming fried foods regularly is linked to an increased risk for type-2 diabetes, according to a study published in "Diabetes Care" in April 2011. It isn't just deep-fried foods that increase your diabetes risk, as another study, published in "Nutrition & Food Science" in 2013, found that women who ate shallow-fried foods daily were more likely to suffer from diabetes than those who ate these foods less frequently. Limiting the amount of fried food you eat can help you lower your risk for prostate cancer. People who ate some of the more typically fried foods, such as fried fish, fried chicken, doughnuts or french fries, at least once a week had a higher risk for prostate cancer compared to those who ate these foods less than once a week in a study published in the journal "Prostate" in June 2013.